December 22 and 23, 2011, mark the inauguration of an exciting initiative sponsored by the state and municipal governments of Oaxaca as well as private enterprise. It's aimed at enabling both tourists to Oaxaca, as well as its residents, to participate in a broad range of cultural experiences. 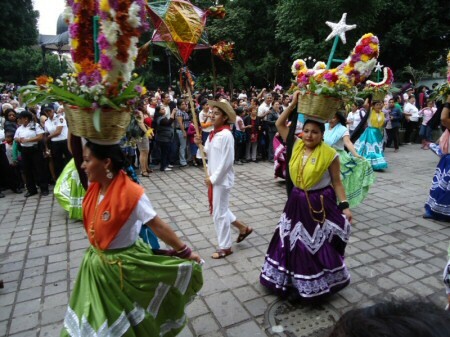 According to Eric Monrroy, developer of the concept, "at Noches Mágicas de Guelaguetza I want people, in one single evening, to be able to take part in and learn as much as possible about Oaxaca; its gastronomic excellence, its music and dance, its color and pageantry, its diversity of crafts, and of course its signature chocolate, coffee and mezcal." Many visitors to Oaxaca book to spend only two or three days in the city, without realizing the richness of the region's offerings until they arrive and it's too late to change their travel plans. Some are in Oaxaca within the context of a longer vacation during which they do a whirlwind tour of several Mexican cities, while others visit the city for a day or two, en route to or returning home from a beach vacation in Huatulco or Puerto Escondido. "The preliminary indication I've received from state officials is the hope that this event will be held three or four times a year," Monrroy continues. "Our government recognizes that in only a few short hours we can expose visitors to the city to an extensive array of Oaxacan traditions; even Oaxacans come out to rejoice and enjoy, largely because of our sense of pride in who we are." Alvin Starkman is a paid contributing writer for Mexico Today, a program for Marca País - Imagen de México. He and his wife operate Casa Machaya Oaxaca Bed & Breakfast. Alvin has spent the past 20 years supporting tourism in Oaxaca, throughout which time he has gained an in-depth knowledge of the rich cultural traditions of Oaxaca and its central valleys. This page has been visited times since September 10, 2012.